Content marketing agencies set to replace traditional ad agencies? 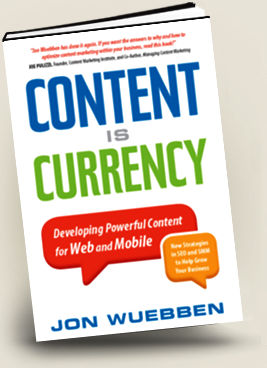 The content marketing agency is replacing the traditional ad agency for many companies, insists Jon Wuebben, CEO of ContentLaunch, in his latest book Content Is Currency: Developing Powerful Content for Web & Mobile (Nicholas Brealey Publishing). “In the process,” says Wuebben, “these firms are savings thousands of dollars and reaching thousands more as a result. Even Procter & Gamble, the world’s largest marketer, seems to have finally woken up to the growing power of content-led marketing. According to Jim Edwards of BusinessInsider.com, P&G’s CEO Robert McDonald recently told Wall Street analysts that he would have to “moderate” the company’s $10 billion advertising budget because Facebook and Google can be “more efficient” than the traditional media that usually account for the lion’s share of P&G’s ad spend. In Content Is Currency, Jon Wuebben explains why … and how. He describes the fine art of content development and shows how customer-grabbing content can tell the story of a product or a business. He looks at how to optimise content for search and social media so that it gets noticed, and provides an insider’s view on the ever-expanding technology and content marketing landscape. The book also includes a suggested “road map to online marketing success”. Content Is Currency: Developing Powerful Content for Web & Mobile is available on Amazon in all major formats. More information is available at http://www.contentiscurrency.com where Chapter 1 can be downloaded for free. More marketers are finding that Google’s recent changes and updates to its ranking system are now making quality content the key driver in search engine optimisation (SEO). At the same time, the changes are shrinking the importance of technical SEO tactics led by mathematicians rather than genuine information providers. This dramatic change in SEO presents an enormous opportunity for content marketers to gain a competitive advantage over rival brands – especially if their competitors are not yet using content-led solutions, such as customer-focused blogs, social media, targeted eNewsletters, videos, eBooks, white papers and eGuides. Now more than ever, the consistent use of high-quality, keyword-driven content, such as that provided by Focus Content Marketing, can elevate your website to the top of search engine results pages (SERPs) … and keep you there. That’s why content marketing is now seen as one of the most effective online marketing techniques available to marketing managers – and why many observers are tipping content-led marketing to explode in 2012. Last year saw some of the biggest and most important changes to Google’s algorithm, including the controversial Panda update which reportedly knocked the wind out of the sails of several high-ranking sites. Ever conscious of the need to keep improving its service to users, Google introduced these algorithm changes because it recognised that some websites with top Google rankings were simply high-traffic, low-quality content sites stuffed with keywords. It set out to limit the visibility of poorly-written filler material created by content ‘farmers’ in favour of sites boasting better-quality authoritative content. Google now uses quantifiable social engagement metrics and recorded data (such as the length of time people spend on a page) to determine how valuable a page is to everyone who lands there. When people spend longer browsing certain pages, Google assumes the content has been read and the user obtained the information they were looking for. The search engines consequently give those pages a higher ranking. If your content is well-written, informative and puts the reader first, it is more likely to keep your potential customer on the page – and Google will recognise this. In other words, if you publish content that keeps your readers happy, Google will be happy too. Similarly, quality content with higher incoming links will also be displayed at the top of the search results. Most importantly, though, delivering trustworthy, problem-solving content will not only elevate you in the search rankings, it will also show potential customers or clients how you can help them. It will enable you to gain their trust … and potentially lead to a positive purchasing decision!